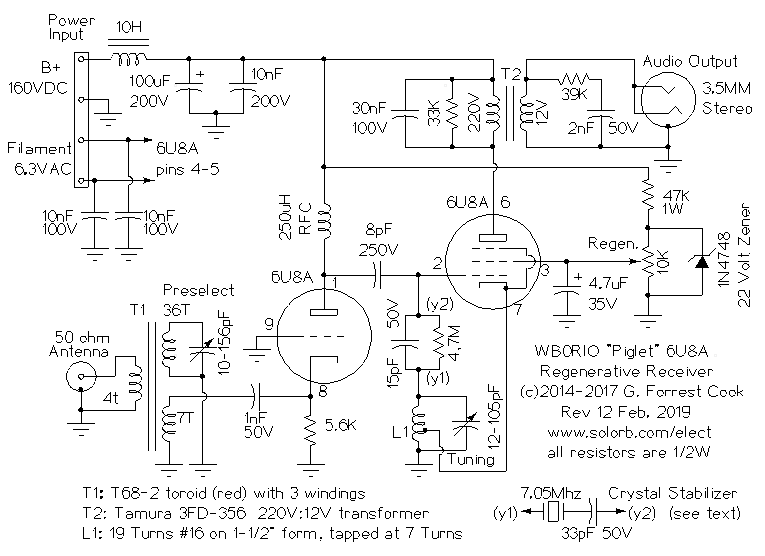 This project is your author's first attempt at building a regenerative receiver. The "Piglet" name comes from the squealing sounds that regenerative receivers make when the regeneration control is adjusted. The receiver tunes from 5-10 Mhz in the shortwave band and it can pick up foreign and domestic AM broadcast stations with ease. If the receiver is built with a narrow tuning range instead of the 5-10 Mhz range, it can be used to receive SSB and CW radio signals in the 40 meter ham band. With minor coil adjustments, the receiver should also work on the 80 and 30 meter ham bands. Regens have always been very popular because they deliver a lot of performance from a small number of parts. Their disadvantages include being rather "tweaky" to adjust, de-tuning from wind on the antenna and a tendency to transmit RF if not properly adjusted. This design fixes the second and third of those issues with an RF isolation amplifier. The 6U8A tube includes a triode and a pentode in one 9 pin envelope. Most 6U8A regen designs use the pentode as the detector and the triode as an audio amp. This design uses the triode as a tuned grounded-grid RF amplifier ahead of the pentode detector section. This arrangement isolates the antenna from the detector stage and greatly improves rejection from strong out-of-band signals. All of the audio amplfication is done outside of the Piglet. My Power Supply for Vacuum Tube Experiments (set for 160VDC) was used to power this project. 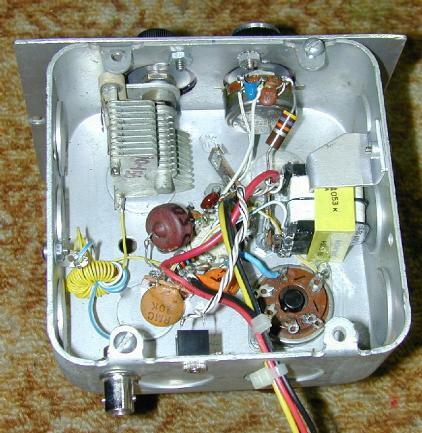 Note that the schematic shows a 10H choke coil in the B+ line, this coil was installed on the power supply, not the receiver box. The supply is sufficient to power the Piglet and the Low Power 6U8A Vacuum Tube Audio Amp V3. If you don't want to build the outboard tube amplifier, a pair of stand-alone amplified computer speakers will also work. This project involves the use of potentially lethal high voltages including 120 VAC and 160 VDC. The project should only be taken on by someone who has experience working with high voltage circuitry. The power supply should always be disconnected and the power supply capacitors should be discharged when working on the receiver. A 10H choke coil and 100uF capacitor are inline with the external power supply's B+ line to keep power supply hum from coming through the audio signal. These parts are mounted on the power supply assembly in the prototype. Two 10nF filament bypass capacitors were used to bypass any extraneous RF to ground. The triode section of the 6U8A is wired in a tuned input grounded grid amplifier configuration. The 50 ohm antenna input is coupled via a 4 turn winding to the tuned input circuit's toroid coil. A 36 turn winding and a 10-156 pF variable capacitor form the resonant part of the tuned input circuit, it covers just beyond the 5-10 Mhz tuning range of the detector. A 7 turn winding matches the input tuned circuit to the cathode of the grounded grid amplifier via a 1nF DC blocking capacitor. The 5.6K resistor sets the bias level of the grounded grid amplifier and the 250uH RF choke isolates the amplified RF input signal from the B+ supply. The output of the RF amplifier is lightly coupled to the pentode detector stage via an 8pF capacitor. The detector's tuned circuit consists of a tapped solenoid coil in parallel with an 12-105pF tuning capacitor. The tuned circuit is lightly coupled to the pentode's control grid via a 20pF capacitor. A 4.7M grid leak resistor provides the grid bias. The value of the small coupling capacitors determine the Q (bandwidth) of the overall receiver. Like all regenerative receivers, the regeneration control is used to keep the detector circuit at the point just below oscillation. The audio output of the detector is picked up on the 220V winding of T2, a common split-bobbin power transformer. The 30nF capacitor and 33K resistor across the transformer's primary produces a broadly resonant audio passband. If a narrower audio bandwith is desired, such as for CW reception, the 33K resistor can be eliminated. The value of the 30nF capacitor can be changed to vary the peak resonant frequency. The RC network on the 12V winding of T2 acts as a low-pass filter, it helps to reduce the high frequency sounds from the received audio. The audio output is taken from the 12V winding on T2, this is fed to the external audio amplifier via the 3.5mm stereo jack. The Regeneration circuit uses a 47K resistor and a 22V (or 24V) Zener diode to produce a regulated 22V supply. The 10K Regeneration potentiometer varies the pentode's screen grid voltage from 0-22V, which spans the region below and above the point of oscillation. The 4.7uF capacitor gives the Regeneration control a smoother response. The receiver was built into a 4-1/2"x4-1/2"x2" electrical utility box. An aluminum plate was mounted on the side of the box with some 6-32 screws to serve as the front panel. The 6U8A tube socket and the Octal coil form socket were installed into knockout holes on the top of the box. A solid box cover plate was used for the bottom of the box. Appropriate holes were drilled for the rest of the components. A number of multi-point terminal strips were installed inside the box and components were installed with the point-to-point wiring method. All RF wiring should be kept as short as possible. The Audio output transformer T2 is held against the bottom of the box using a spring-loaded aluminum bracket that is bolted to the side of the box. The L1 mixer coil was wound onto a custom coil form. The form was made by gluing a section of plastic sink drain pipe to the base of an old octal tube. Small holes were drilled in the pipe to secure the ends of the wires. A matching octal tube socket was mounted to the chassis. The L1 pluggable coil form was originally used with the intention of being able to use different coils for different bands. The circuit design changed during prototyping and the T1 tuned input circuit was added. Transformer T1 could be bult as a pluggable coil if you want to be able to change bands. For single band operation, L1 could be built without the plug and socket. In this first prototype, the coil form was mounted too close to the 6U8A tube and undesired oscillations would occur with certain tubes. The solution involved placing a grounded piece of printed circuit board material between the tube and the coil. A better solution would be to use a metallic tube shield and/or move the tube to a box hole that is farther from the coil. A well-stocked junk box is the first place to start, your author scrounged most of the parts for this project from discarded electronics. 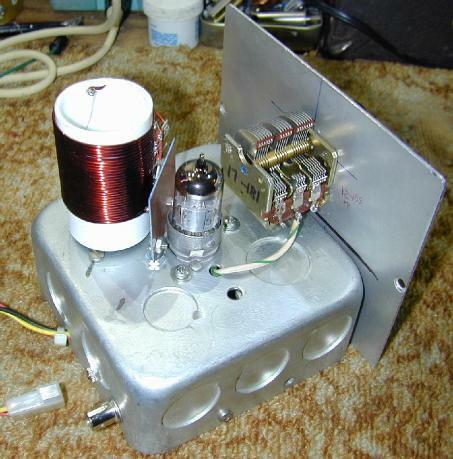 The tuning capacitor came from an old radio and included a built-in gear-reduction drive. If you use a regular variable capacitor, a vernier dial is highly recommended. Tubes and sockets can be found at Antique Electrical Supply or on eBay. The split-bobbin transformer can be purchased from Mouser, Newark, Jameco or Digi-Key. Home Depot, or any well-stocked hardware store will carry the electrical boxes and plumbing parts. Connect an antenna, power supply and audio amplifier or amplified computer speakers to the receiver. Be sure to ground the receiver chassis for safety and performance. A standard 40 meter ham radio dipole will work well with this receiver, a random longwire antenna will also be sufficient. Apply power to the receiver and let it warm up for a few minutes. Adjust the Tuning capacitor to a part of the band that you want to listen to. Adjust the Regeneration control until the receiver just starts to hiss. Adjust the Preselect control for the loudest signal, if the receiver starts to squeal, turn the Regen control down a bit. Adjust the Tuning control until you hear a station. All three controls will interact with each other so it is a bit of an art form to get the receiver tuned to a station and peaked for the best signal. Once the controls are set correctly, the audio quality will be quite good. If you tune to an active area on the shortwave band, multiple stations can be selected with just the Tuning control. The initial design of this receiver covers 5-10 Mhz, which includes several shortwave broadcast bands, the 40 meter ham radio band and the 5 and 10 Mhz WWV time stations. This design can easily be modified to receive frequencies from the AM broadcast band up to 25 Mhz or so. Different bands can be covered by changing the resonant frequencies of the two tuned circuits. The detector coil (L1) is already wound on a plug-in coil form. It would be relatively easy to construct other plug-in coils, just use a similar turns percentage (about 30% from the bottom) for locating the cathode tap. The extra pins on the coil socket could be used to connect the unused tuning capacitor sections for operation on lower frequencies. The preselector coil could also be built with a plug-in form, different types of toroid material and turn counts would be required for coverage of other frequency bands. 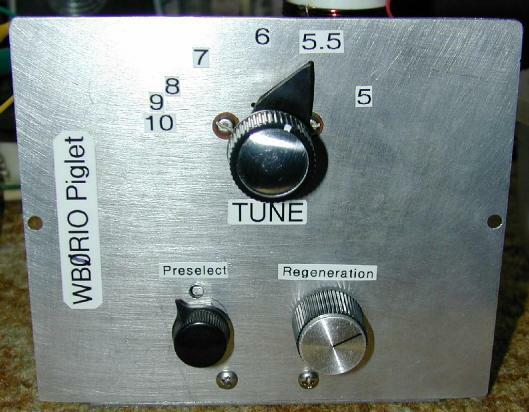 If the receiver is to be used to pick up ham radio signals, the tuning range should be reduced to cover a much smaller range, such as 6.9-7.4 Mhz. This can be accomplished by replacing the tuning capacitor with a much smaller value variable capacitor and placing a fixed capacitor across the new tuning capacitor to set the range. It may be helpful to use a trimmer capacitor across the fixed capacitor so that it is possible to center the tuning range over the band of interest. An experimental crystal stabilizer was added to the regenerative feedback loop in an effort to stabilize the receiver over a narrow band of the radio spectrum. The results were quite impressive, when the receiver was tuned to near the crystal frequency it suddenly became more sensitive and more stable. Morse code signals could be copied easily and could be listened to for many minutes without any significant drift. A large FT-243 ham radio crystal with a nominal frequency of 7.05 Mhz was used. With the crystal installed in the socket, the receiver can tune from about 7.03 to 7.05 Mhz with the sensitivity dropping off on the edges of that range. When the tuning capacitor is adjusted so that the LC circuit resonates with the crystal, one can hear the crystal "pop in" to resonance and the received signals get much stronger. When the crystal is removed from the socket, the receiver goes back to its normal wide-band operation. For crystal-stabilized operation, the tuning capacitor configuration should be modified for single band operation (see above). Other options for crystal stabilized tuning include adding a small coil in series with the crystal, using multiple crystals in parallel and using a ceramic resonator instead of a crystal. Ceramic resonators are known to have a wider pulling range than quartz crystals.